The first time I saw Augmented Reality in action, I wondered if I'd accidentally fallen through a wormhole on the way to work; it's the kind of thing you'd expect to see on Boba Fett’s BlackBerry. AR is downright futuristic. 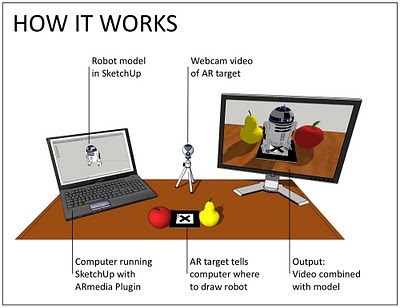 A simple Augmented Reality setup for SketchUp, using an external monitor to show the video output. Note that a second monitor isn't necessary for using this plugin. It's available for both Windows and Mac OSX. It's available in three flavors: Free (Personal Learning Edition), Professional Lite and Professional. I was able to use it, which means that it can't be that hard to figure out. Start out by grabbing the Quick Start Guide; you'll find the relevant links about halfway down the plugin's webpage. Follow Steps 2 and 3 to download and install the software; the free Personal Learning Edition will let you see how everything works without spending any money. 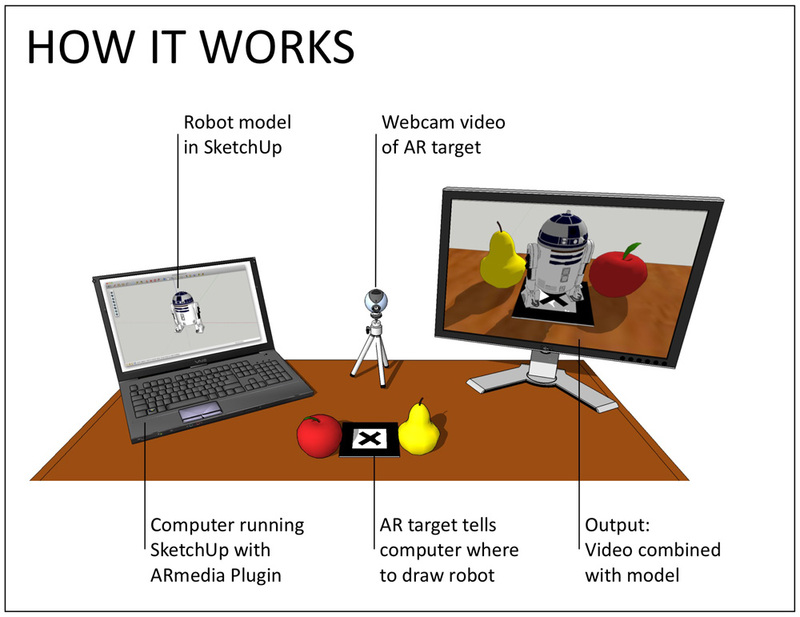 After that, achieve instant gratification (my favorite kind) by skipping ahead to Step 6 in the Quick Start Guide: "Creating your first Augmented Reality Scene". Please use this post's Comments thread to discuss the ways you think AR might benefit you. simply amazing discovery. I'm thinking, "Beam me up Scotty!". It's so well done it takes you a few seconds to realize what's happened in the first video. Then you say whoa. Dreaming of iPhone App version. Loved it. I want to do more with it. I would like to be able to use it to show clients how a piece of funriture might look in place. Trouble is, from my initial exploration of the free version, it looks like I need a target 80" square to do this. The perfect way for designers of any kind (from engineers to packaging designers) to share early stage concepts with clients and team members. Outstanding!